We write because we have reasons that compel us to, a voice where one didn’t exist, a story determined to be written, a calling. I didn’t become a writer to be praised, to have people fawn all over me, to been someone’s queen. Those are all great things, if that’s how you measure your self worth. And certainly it feels fantastic to be told how your work has influenced someone. But that’s not why I write. I write because, simply, I have something to say. Because I can tell a story and I love doing it. Because there are few stories out there for me. Because I want to be a master storyteller. It’s what I’ve always wanted and it’s how I’m programmed. Being with a large group of writers this weekend at the AWP conference in Chicago taught me two things — not everyone thinks that way and I know what kind of writer I don’t want to become. While I have met some great people, there is a large group who are sharks. There are so many here that I can smell the blood in the water. It’s a competition. Who can get the most attention for their reading, book, chap book, organization, etc. Which program is the best? Why I’m a superstar and why you should know me. I thought we were hear to talk about writing? 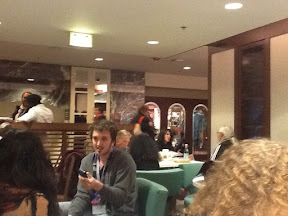 As I write this, I am currently in the over-priced cafe in the large and over designed hotel where this event is hosted. I’ve walked out of my second panel in two days, I avoided going to another panel because it was at another hotel and the bus was too late to go. I haven’t had a conversation with a soul since earlier this afternoon though I’m surrounded by thousands of people — I don’t feel the need to engage with my fellow writers for fear of disappointment. But I guess I already am. The entire time I’ve been here I’ve thanked my lucky stars that I’m a journalist. And though working at a daily newspaper does little to protect your writing spirit, it does keep you grounded into the reality. The reality here is that “writer” means different things to different people. To me it’s this life mission, this purpose, a calling. Its also a gift. I’m not sure if even five percent of the people at this conference share the same vision. One more day and I return to create in the safety of my world.